MBLM, the Brand Intimacy Agency focused on strategy, design, creative and technology, announced today that the health & beauty industry ranked third for brand intimacy, after automotive and retail. 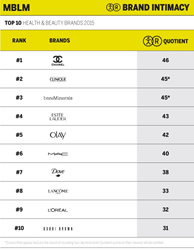 Chanel was the top most intimate brand in the industry, according to the agency’s extensive Brand Intimacy 2015 Report. Brand intimacy describes an essential relationship between a person and brand that transcends usage, purchase and loyalty. According to the report, intimate brands create enhanced business performance. The remaining brands part of the top 10 are: Clinique, bareMinerals, Estée Lauder, Olay, MAC, Dove, Lancôme, L’Oréal and Bobbi Brown. Also of note, Sephora, (a major retailer of health and beauty products) ranked third in MBLM’s retail category and 15th overall. Retail sales in health & beauty in the U.S. came in at $87.21 billion in 2013 and the global beauty market grew by 4.5 percent annually over the last 20 years. MBLM’s 2015 report contains one of the most comprehensive rankings of brands based on emotion, analyzing the responses of 6,000 consumers and 52,000 brand evaluations across nine industries in the U.S., Mexico and UAE. MBLM’s reports and interactive Brand Ranking Tool showcase the performance of almost 400 brands, revealing the characteristics and intensity of the consumer bonds. To download the full Brand Intimacy 2015 Report or explore the Ranking Tool please visit: http://mblm.com/brandintimacy/.